The club cruise to Rochester will be on the May bank holiday and will coincide with the Sweeps festival which finishes with a firework display on the last day. 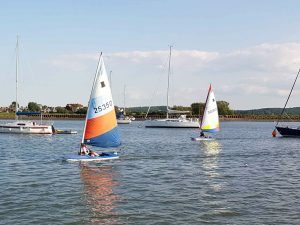 Come and have a go at sailing one of the clubs Topper dinghy’s. Suitable for both Adults and Children the dinghy’s will be supervised and tuition provided. RBYC will be visiting this weekend and, live entertainment will be provided at the River Breeze Cafe along with a BBQ meal. For more detail contact the River Breeze Cafe . For more information contact Commodore Paul Manners or speak to a member of staff at the River Breeze cafe. WWYC will holding the club summer BBQ at the River Breeze Cafe , with live entertainment and prizes to be won. For more information contact Commodore Paul Manners or a member of staff at the River Breeze Cafe. The Commodores sail past will take place on the 10th November, a free buffet will provided at the River Breeze Cafe afterwards for lunch.